Billy Mitchell piloted this Spad XVI on many observation flights over the front lines during pivotal battles in the last months of the war. 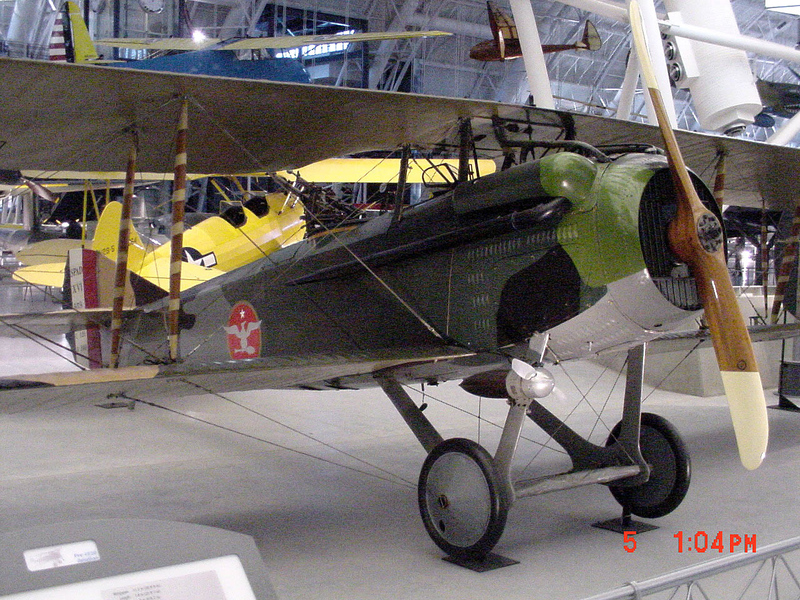 The Spad XVI is on display at the Steven F. Udvar-Hazy Center. This photo shows the cockpit of the Museum's SPAD XVI. Panoramic view inside the SPAD XVI. The Spad XVI was a two-seat version of the very successful single-seat Spad fighters of World War I, the Spad VII and the Spad XIII. The first Spad two-seater design to see front-line service was the Spad XI. The Spad XVI was an attempt to improve upon it by replacing the Spad XI's 220-horsepower Hispano-Suiza engine with a 240-horsepower Lorraine-Dietrich 8Bb. The Spad XVI appeared in January 1918. It was slightly faster than the Spad XI, but had a lower ceiling and the same poor handling qualities. It offered no overall improvement. Nevertheless, approximately 1,000 Spad XVIs were built, ultimately equipping 32 French escadrilles. 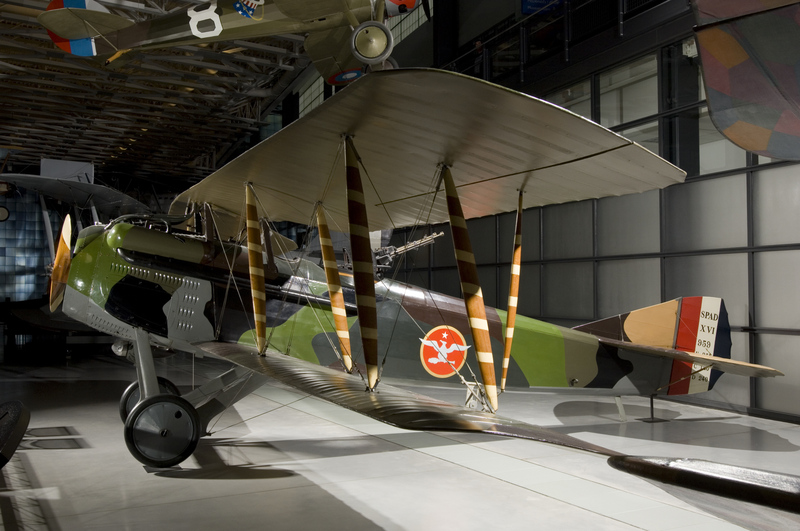 An otherwise undistinguished aircraft, the Spad XVI in the NASM collection is significant because of its association with Brigadier General William "Billy" Mitchell. He piloted this Spad XVI on many observation flights over the front lines during pivotal battles in the last months of the war. The Spad XVI was a two-seat version of the very successful single-seat Spad fighters of the First World War, the Spad VII and the Spad XIII. The first Spad two-seater design to see front-line service was the Spad XI. It was armed with one fixed, forward-firing Vickers machine gun, and one or two Lewis guns on a flexible mount at the rear cockpit. It could carry a total bomb load of 70 kg (154 lb) under the lower wings. The Spad XI was introduced in 1917, but immediately ran into production difficulties because of problems with the reduction gear of its 220-horsepower Hispano-Suiza engine. The aircraft also had performance shortcomings. It lacked maneuverability, it was prone to stalling, and it was difficult to fly. Despite the production and design problems, approximately 1,000 Spad XIs were built and served with 12 French Escadrilles, as well as with the air services of Belgium, Japan, Russia, Uruguay, and the United States. The Spad XVI was an attempt to improve upon the Spad XI by replacing its Hispano-Suiza engine with a 240-horsepower Lorraine-Dietrich 8 Bb. It was otherwise quite similar to the Spad XI. It was a two-bay biplane, with a slight sweep-back on both wings, and ailerons on the top wing only. One interesting safety feature was a provision for dumping the fuel from the main tank, located under the pilot seat, in the event of fire. An auxiliary fuel tank was located in the top wing. Armament was the same as on the Spad XI. The Spad XVI appeared in January 1918. It was slightly faster than the Spad XI, but had a lower ceiling and the same poor handling qualities. It offered no overall improvement. Nevertheless, approximately 1,000 Spad XVIs were built, ultimately equipping 32 French escadrilles. An otherwise undistinguished aircraft, the Spad XVI in the NASM collection is significant because of its association with Brigadier General William "Billy" Mitchell. Six Spad XVIs were acquired from the French in August 1918. One of these, serial number 9392, became Mitchell's personal aircraft. He piloted it on many observation flights over the front lines during pivotal battles in the last months of the war. He received the Distinguished Service Cross in November 1918 for "repeated acts of extraordinary heroism in action." His citation made special mention of the "daily reconnaissances over the lines during the battle of St. Mihiel salient, September 12th to 16th, securing valuable information of the enemy troops in the air and on the ground, which led to the excellent combined action by the Allied air services and ground troops particularly in this battle." Shortly after the Armistice, Mitchell flew the Prince of Wales in this airplane over the Rhine River to observe American Army installations in the American area of occupation. Mitchell's Spad XVI was transferred from the U.S. War Department to the Smithsonian Institution in 1920. Transferred from the U.S. War Department. Single-engine, two-seat, French-built World War I reconnaissance and bomber aircraft; 240-horsepower Lorraine-Dietrich 8Bb engine. Green, gray, and brown camouflage finish upper surfaces. Gray under surfaces.